The best energy-saving machine in the industry has been realized with a new original motor developed in-house. The cutting-edge dry head technology significantly increases the grease duration. A new motor has been developed specifically for the FX-7200C. The power consumption of the machine is approximately 50% less than that with the V-belt driven system (with an AC Servo Motor) and approximately 12% less than that of the FX-7200B. This direct drive sewing machine offers the best energy. The duration of the grease that is necessary for the dry head has been extended to about double that of the FX-7200B and about six times that of the FX-7200A. The integrated cutting-edge dry head technology significantly increases the grease duration. Greasing maintenance will only be required FX-7200B once in about ten years under the following condition: operating days per year: 300 days, operating time per day: 10 hours, operation rate: 16%, sewing speed: 4,000 RPM. With the safety sensor detecting, the motor does not start while the machine head is tilted back, even when the treadle is depressed. The amount of oil in the gearbox can be checked visually. The gearbox has a heat-discharging structure with a fin. This type is equipped with a sealed oil tank, supplying constant clean oil only to the minimum parts requiring lubrication. The operation noise of the solenoids of reverse feed changeover, thread trimming and thread wiping has been reduced. The sound during sewing has been improved in sound pressure and sound quality. Offensive sound and vibration are reduced to a minimum, helping reduce stress and fatigue of operators. Looking for ideal Mini Oil Computerized Single Needle Lockstitch Sewing Machine Manufacturer & supplier ? We have a wide selection at great prices to help you get creative. 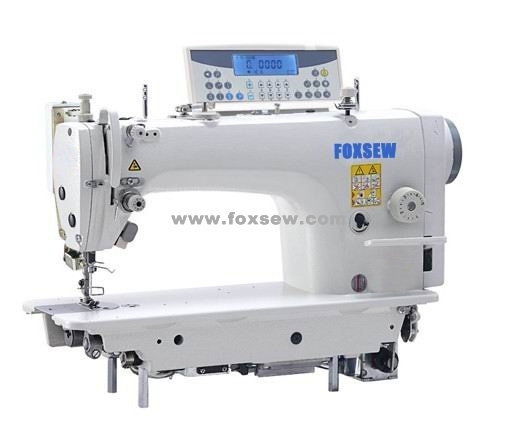 All the Dry Head Single Needle Lockstitch Sewing Machine are quality guaranteed. We are China Origin Factory of Direct Drive Double Needle Lockstitch Sewing Machine. If you have any question, please feel free to contact us.